Outdoor play is an important part of the developmental experience of the young child. It is associated with increased physical activity and has long-term positive implications for young children. Children who play regularly outside are more likely to be thinner and fit, may develop better immune systems, encourage different types of physical play, increase strength and coordination and possess lower stress levels. In addition to these physical benefits, outdoor play can increase general enjoyment of the outdoors, learning about the natural environment and engagement in more creative play, which in turn leads to more active imaginations, increase regard of self and others and more opportunity for constructive play. These benefits are more greatly developed when children’s outdoor play spaces are created with thought and intentionality. When creating a high quality outdoor play space, all of the above benefits must be considered. Areas for running, jumping, socio-dramatic play and materials to explore must be included. Head Start Body Start (HSBS) National Center for Physical Development and Outdoor Play developed a play space assessment in 2010 to guide early childhood programs in creating and assessing play spaces to allow for appropriate movement and play opportunities for children of all abilities. It is based on research in both early childhood and physical fitness. It can be downloaded at Head Start’s Early Childhood Knowledge and Learning Center (ECKLC) website at https://eclkc.ohs.acf.hhs.gov (search “play space assessment"). 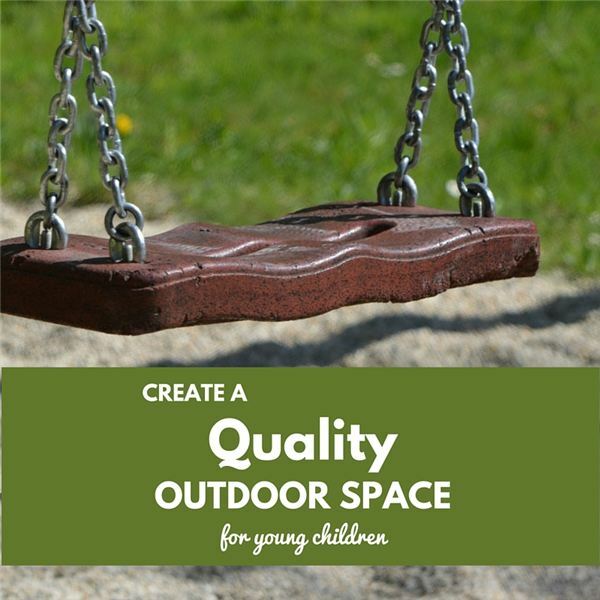 It identifies 11 categories of high quality outdoor spaces, which cover such areas as key features, movement, flexibility and play, shelter and shade, natural features, sensory elements, accessibility, risk and safety features. The following includes a brief discussion of each category of the assessment. Key Features: A variety of manufactured and natural materials to provide experiences for a sense of freedom, discovery, exploration, creativity, innovation and sensory stimulation. Examples would be bike tracks, grassy areas, climbing structures, sand areas, variety of balls. Movement Opportunities: Opportunities for traveling actions such as skipping and climbing, stabilizing actions such as swinging, pushing and pulling, and manipulating actions like throwing, bouncing, and kicking. Flexibility and Play: functional (gross motor), construction (building, fine motor and cognition), and symbolic play (role play/fantasy) opportunities. Shelter and Shade Structures: Plat spaces located under natural or artificial such as tress or umbrellas. Natural Features: Includes natural elements for play such as tree stumps, water and pebbles. Also, flowering plants and topographic variations are encouraged. Welcoming Atmosphere: Inviting atmosphere by being clean, organized and in good repair. Should include at least two decorative elements like statues, flags or cultural artifact. Sensory Elements: Provide opportunities for a variety of sensory experiences including touch, smell, sound, vestibular and proprioceptive input. Try swings, slides, throwing, lifting and climbing. Accessibility and Inclusive Play: Incorporate an accessible swing to a swing set or an elevated sandbox to allow access for children of all abilities. Risk and Challenge: Allow children to experience adventure and excitement. Open-ended activities that challenge physical, social and cognitive skills by having areas for hiding or introducing inside materials to the outdoors are great ways to add adventure. Surfacing: Add a variety of textures and provide soft, cushiony surface under swing set and other equipment. Enclosures and Safety Features: Safe and free of hazards by eliminating sharp edges, entrapment openings, and protrusion or entanglement hazards. Enclose the play space with appropriate fencing. The Play Space Assessment provides a framework for ensuring quality for outdoor play for preschoolers. This assessment tool has been reviewed and promoted by the National Association of the Education of Young Children as developmentally appropriate and they have encourages its use by childcare centers and preschool programs across the nation. Outdoor play can incorporate all areas of development if it is planned and designed with intention and thought. Creating areas to support social and physical play, as well as cognitive growth will ensure that your outdoor play space meets high quality standards! Spencer, K. H. & Wright. (2014). Quality Outdoor Play Spaces for Young Children. Young Children. Retrieved from www.naeyc.com/yc. Head Start Body Start Play Space Assessment. National Center for Physical Development and Outdoor Play. Retrieved from www.headstartbodystart.org.